성균관대학교 강북삼성병원 박동일 교수님팀에서 크론병 환자의 위내시경에서 관찰되는 bamboo joint-like appearance에 대한 논문을 발표한 바 있습니다 (강문수. 대한소화기내시경학회지 2006). 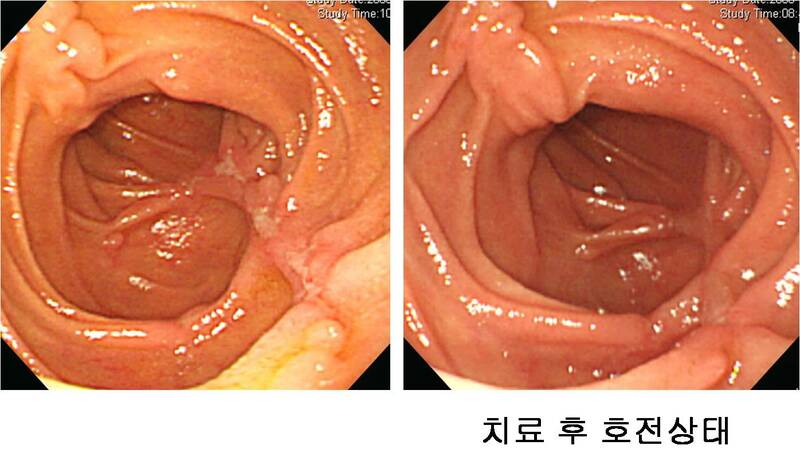 Typical gastroduodenal endoscopic findings in a Crohn's disease patient in remission stage (lizuka M. WGJ 2012)라는 제목의 일본 논문에도 좋은 사진이 있었습니다. 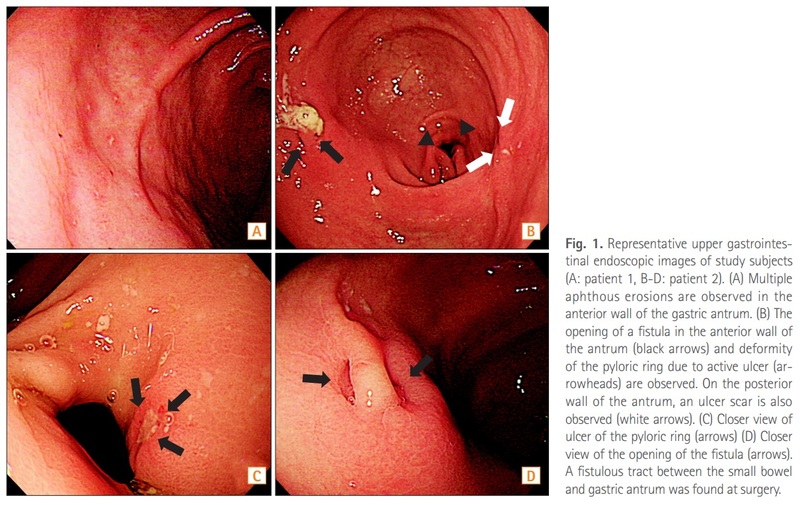 Gastroduodenal endoscopic findings of the patient. 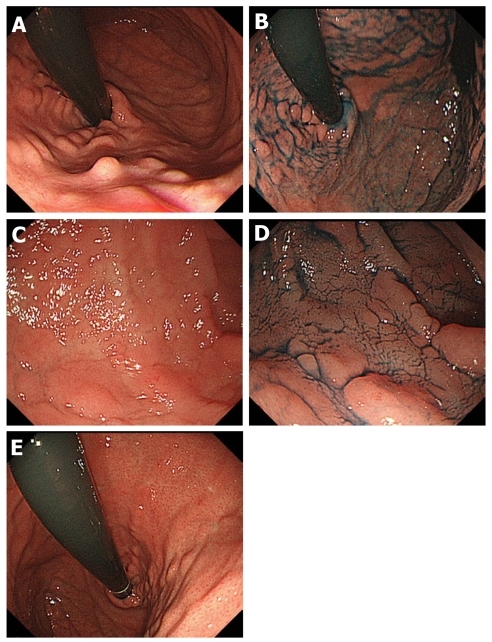 A: Endoscopic view of bamboo-joint-like appearance on the lesser curvature of the gastric body and cardia; B: Bamboo-joint-like appearance was more clearly observed by spraying with indigo carmine dye; C: Endoscopic view of notches on the Kerckring’s folds of the duodenum; D: Notch sign was more clearly observed by spraying with indigo carmine dye; E: The bamboo-joint-like appearance was localized in the lesser curvature of the upper gastric body and cardia. 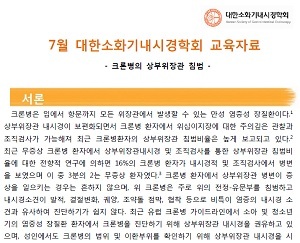 On-line에서 무료로 PDF를 볼 수 있는 몇 개의 논문을 소개합니다. 크론병은 보통 하부위장관 질환이지만 간혹 상부위장관 침범을 보이기도 합니다. 소장수술을 통하여 크론병으로 확진된 바 있는 50대 여성으로 duodenum에서도 크론병의 전형적인 longitudinal ulcer가 잘 보였던 경우입니다. 이 정도 특징적이면 크론병의 십이지장 침범으로 진단하는데 무리가 없다고 생각됩니다. 크론병 치료를 하면서 호전된 점도 supporting evidence일 것입니다. 그러나 간혹 애매한 소견만 보인 환자에서는 상부위장관 질환과 크론병과의 관련성을 입증하기 어렵습니다.